A little over two years ago, I published a series of well received articles on SaaS metrics that culminated in the SaaS Metrics Guide to SaaS Financial Performance. Since then, I’ve received numerous inquiries regarding the many practical quirks encountered in day-to-day SaaS metrics implementation. 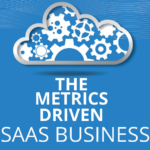 In response, I’ve decided to revisit the SaaS metrics topic with this series of SaaS Metrics FAQs where I’ll elaborate on some of these finer SaaS metrics details in a simple Q&A format. This first SaaS Metrics FAQs installment tackles the many problems associated with measuring SaaS churn, so if you have a Q, please feel free to submit it in the comments and I’ll do my best to provide an A.
SaaS Metrics FAQ #1 | What is Churn? SaaS churn is the percentage rate at which SaaS customers cancel their recurring revenue subscriptions. It is a key SaaS metric of historical SaaS business performance and an important parameter in revenue forecasting. When used in forecasting, SaaS churn can be interpreted as the probability rate at which customers will cancel their subscriptions. In it’s simplest form, SaaS churn can be stated as the number of customers cancelling (ΔC) per time interval (Δt) divided by the number of customers at the beginning of the interval (C). In the formula above, the Δ is a common math symbol that means change or interval. That’s the simple answer. 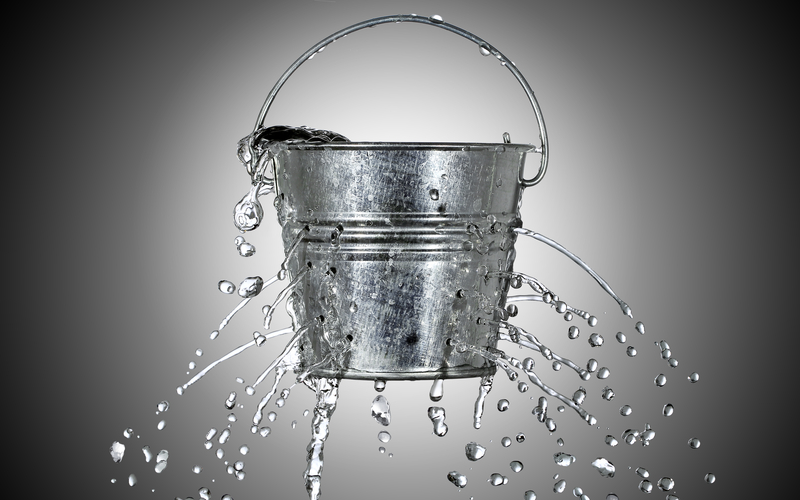 In practice, SaaS churn can be both difficult to define and difficult to measure. For example, it is very common to define SaaS churn rates at the customer level (customer churn), subscription level (product churn), and recurring revenue level (MRR or ARR weighted churn). Moreover, measuring SaaS churn can be complicated by low churn rates, high churn rates, high growth rates, variety of customer types, variety of subscription contract renewal periods, variety of contract MRR values, and changes in the SaaS churn rate itself over time. In it’s most complicated form, SaaS churn is the result of a Poisson process which statisticians would employ survival analysis in place of the simple formulas we generally use to calculate churn rates. So, if you get confused when you attempt to turn theory into practice, don’t worry, you are not alone. In the SaaS Metrics FAQ #3 below, I’ll provide some shortcuts for calculating accurate SaaS churn rates, while keeping the math to a minumum (really!). SaaS Metrics FAQ #2 | Why is churn such an important SaaS metric? The reason the SaaS churn rate dominates over virtually all other SaaS metrics is that SaaS churn is in direct opposition to growth; the primary objective of most SaaS businesses. As the limiting factor to growth, the SaaS churn rate has a very negative impact on both SaaS profitability and SaaS company valuation. 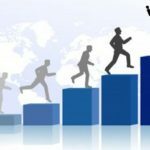 Moreover, SaaS churn increases with the size of the customer base, so it is essentially negative virality, and as such is incredibly difficult to overcome. Graphically, SaaS churn tends to follow what is called a negative exponential distribution (shown below, it is the opposite of the positive exponential distribution associated with viral growth). fall off within one customer lifetime, but some customers hang around for a very long time. In plain English, you spend an awful lot of money, time and energy acquiring customers in SaaS. You recover this investment over time, so you want your customers to stick around as long as possible. The longer they stay, the stronger your business. 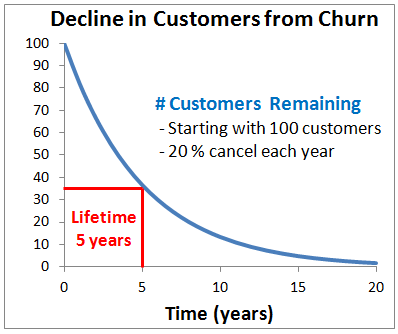 This is why the value of one divided by the SaaS churn rate is often quoted as the average customer lifetime; lower SaaS churn equals longer customer lifetimes equals larger customer lifetime value. SaaS Metrics FAQ #3 | How do I calculate churn in practice? Well, it depends. In order to calculate churn accurately, you should make some attempt to achieve the following ideal SaaS churn calculation requirements. Uniform Customer Population: Calculate churn across a uniform population of customers; uniform meaning they all have the same probability of cancelling during the measurement interval. Matched Customer Population: Calculate churn by matching the population of customers that actually do cancel (ΔC) to the original population of customers that might possibly cancel (C). 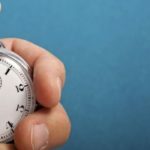 The Right Measurement Interval: Calculate churn using a time measurement interval (Δt) that isn’t so short that you don’t get enough cancellations, or so long that you get too many. Otherwise, simple churn calculation formulas can yield statistically insignificant, biased, and random results. MRR Uncorrelated to Churn: If MRR gets mixed up with churn, such as big customers cancelling more frequently than small ones, then revenue churn may differ dramatically from customer churn, and in the end, it’s revenue that counts! Stable Business Process: Most SaaS businesses are constantly tinkering with their business processes to improve them. A SaaS startup may not have achieved a stable business model or recurring revenue stream. 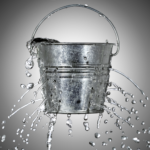 Measuring SaaS churn across dramatic business process changes will yield poor results. Ideally, you will measure SaaS churn before and after important changes in your business to understand their impact on churn. What does this mean in practice? Most people begin to calculate churn by subtracting the number of customers remaining at the end of a month from the number of customers at the beginning of a month and divide by the number of customers at the beginning of the month. And, then they multiply the monthly churn rate by twelve to get the annual churn rate. This is OK, provided you don’t have any of the following common churn calculation problems. Just to name a few! The careful observer will note that each of the above situations creates problems by violating the respective ideal churn calculation assumption identified in parenthesis. Here are some SaaS churn calculation tips that will help you avoid many of the SaaS churn calculation pitfalls above without calling in a statistician or overly complicating your churn calculations. When the churn rate is small, so many math things work out better for SaaS churn rate calculation accuracy, as well as in your SaaS business! However, even if your churn rate is large, you can improve the accuracy of your SaaS churn rate calculation by choosing a measurement interval where the total churn within the interval is small. Consider a SaaS business with 25% monthly churn and 100 customers. At the end of months 1, 2, and 3 there will be 75 = 100 * .75, 56 = 75*.75, 42 = 56 * .75 customers respectively. If you use a measurement interval of one quarter, you will likely calculate a churn rate of 19% = (100 – 42)/3 instead of 25%. 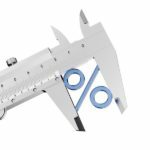 When churn within the measurement interval is too high, your churn calculation will consistently underestimate the true churn rate. Your customers can’t churn unless their contracts are up. If you use annual contracts, only 1 in 12 of your customers can cancel in any given month. On the other hand, for those 1 in 12 that can cancel, you are actually measuring the annual churn rate, because they’ve been around for a full year already. If you customer population is super duper big and uniform and you have zero growth, these two biases will cancel each other out. But, a safer bet is simply to choose a measurement interval that is close to your average contract renewal period. One frequent source of churn calculation frustration comes from reconciling Tip #1 above which entails a shorter churn measurement interval with Tip #2 which usually entails a longer churn measurement interval. The solution to this problem requires a little more complex math and is given in Tip #7 below. If you can’t seem to find a happy medium between a low churn rate in your measurement interval (Tip #1) and a measurement interval equal to your average contract renewal period (Tip #2), then your best bet is to stop aggregating over the measurement time interval and base your SaaS churn rate calculation only on contracts that are up for renewal. 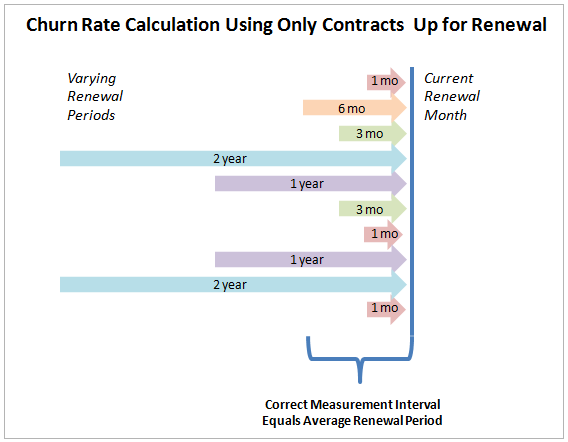 The trick here is that since you are selectively only looking at contracts up for renewal and they may have many different renewal periods, the correct measurement interval to use in your SaaS churn rate calculation is the average contract renewal period of all the contracts in your renewal sample for the month. to use in your SaaS churn rate calculation is the average contract renewal period. The formula is the same, but the denominator only counts the number of contracts up for renewal in the month and the numerator counts the number of contracts up for renewal in the month that cancel. This is one of the most accurate ways to calculate churn provided you have enough contracts up for renewal each month. It is also the only approach that completely disentangles churn from growth, so it is particularly relevant in high growth situations. Too much aggregation over non-uniform customer populations can distort your SaaS churn rate calculation. Whereas separating different types of customers into churn cohorts and calculating churn separately for each churn cohort can identify important levers you can push to improve your business. can hide problems and untapped opportunities for improvement in your SaaS business. Churn among customers frequently varies by contract MRR, renewal period, tire kickers vs. loyalists, and a host of customer attributes that you are already collecting in your CRM system that are just waiting to be analyzed. Recurring revenue churn is calculated by substituting monthly recurring revenue or annual recurring revenue (MRR or ARR) into the standard customer churn calculation. It is essentially a recurring revenue weighted version of simple customer churn, i.e., big customers count more than smaller ones. The customer churn calculation can hide significant financial problems, such as downgrades or higher churn rates among larger customers. Conversely, it might make things look worse than they really are from a business viability point of view. Routinely measuring and comparing customer churn and MRR churn will help you detect nuances within your customer base that have a direct financial impact on your SaaS business. Perhaps the most useful aspect of MRR churn is the insight it provides into upgrades and downgrades, two important financial metrics that are not measured by the simple customer churn calculation. The calculation is essentially similar to calculating churn cohorts, one need merely identify those subscriptions that increased, decreased or disappeared altogether during the measurement interval and calculate MRR churn (MRR growth in the case of upgrades) separately for each category. Where mi is the monthly churn rate for month i. The reason this is the true formula is that the number of customers hanging around at the end of 12 months is calculated thus. For example, suppose your monthly churn rate measurement comes out to be 10%. Multiplying by 12 would give an annual churn rate of 120%!? Which is clearly not possible, as a churn rate cannot exceed 100%. The correct answer is 72% = 1 – ( 1 – .1 )^12. 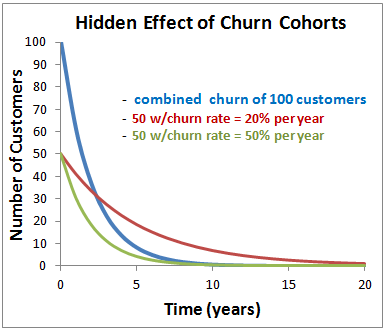 The reason you can often simply multiply by 12 to convert the monthly churn rate into the annual churn rate is that is just so happens that for time intervals less than about 10% of the average customer lifetime (or total churn in interval < 10%) the following approximation applies. Unfortunately, this approximation can really mess up your numbers in high churn situations. I say 10% because 2 x 10% = 20% whereas the exact formula gives 19% = 1 – ( 1 – 10% )^2, which is more accurate than most businesses care about or the SaaS churn model in the first place. More than 10%, however, and calculations become pretty inaccurate. The inverse of this formula is also useful. Recall the example from Tip #1 above, where a quarterly measurement interval caused us to miscalculate the monthly churn rate as 19% instead of 25%. In this example, we had 100 customers to start and only 42 left at the end of a quarter. Had we used the correct formula to calculate monthly churn from quarterly in this example we would have done the following. If you are willing to do the math above, then you can use longer measurement intervals even when churn is high and there is no need to follow Tip #1. After working for a start-up SaaS company, I can testify that this is the scariest metric to know… especially for the owners. The owners of my SaaS company relied on the old head-in-sand method of dealing to deal with a high churn. That is NOT the way to do it. I like your method much better. It might help if the formula explicitly backs out the number of new customers, those who subscribed during the period, from the C end. That may eliminate potential confusion. Though still subject to some flaws, that would at least partially disentangle churn from growth. SaaS companies shouldn’t be masking high churn with high growth. Thanks for the comment. You are absolutely correct! My Cend is meant to be only those customers that were originally left over from Cbegin and should exclude any new customers (cnew) booked in the measurement interval from the calculation altogether. Upon re-reading the post, this is not clear…so, I will make some edits. This also gives a good opportunity to explain in more detail exactly how growth becomes entangled with churn (outside of including new customers in the numerator, ΔC, which as you point out should simply never be done. However, growth can still be a problem in calculating churn, because it is all but impossible to exclude it from the denominator, (Cbegin). For example, if you book 50 new customers in month 1 and you have contract renewal periods longer than one month, how do you handle them in month 2, 3, etc? If you include them in month 2 in (Cbegin), but they cannot actually cancel their contracts for say 3, 6, 12, or 24 months, then you will systematically underestimate churn. If you have lots of different contract lengths, then when exactly do you include them? The above is the rationale behind tip #2 and tip #3. Tip #2 averages over the problem to a degree, but it does not solve it entirely. Tip #3 eliminates this problem altogether by measuring only contracts that are up for renewal. This is why tip #3 is the most accurate approach of all for disentangling growth. However, all approaches are subject to accuracy issues in very high churn scenarios (tip #7). Thanks again for the constructive feedback! This is an extremely interesting piece of work – much greater detail than I was expecting (it took me back to maths exams a great deal of time ago). I’m currently writing a piece about the marginal additional profitability of a customer if you can extend their average length of stay by +6 months / +12 months. Going to look over this again tonight, especially the examples. Brilliant summary – very practical, thanks Joel! Good job! Love your post! Very helpful. where 1.20 is a 20% growth in my revenues. As chur should be discounted to the growth of my revenue. Not sure exactly what you are asking, but I think the example above means you are assuming a 5% monthly churn rate and a 20% annual growth rate….yes? In which case, I think you meant (.95 ^12)*(1/1.20). You are absolutely correct that you need to adjust for growth when you have it to calculate the correct value of churn. The formula I use in the post assumes either zero growth or that you are separating out growth customers and only dealing with original customers and the subset of those that churn. The formula in your example is close, but not quite correct. I’ll provide the correct formula to adjust for growth below, but here are a couple of calculation tips to help keep things clear. First, it’s good practice to separate churn from growth cleanly in your data and calculations. Also, it’s generally clearer to stick to a single time interval, i.e., monthly or annual, but not both, in your calculations…then convert from monthly to annual after the fact. It makes more sense if you lay out the entire formula for change in customers over time, including both churn and growth. In the formula above, you can see that the entire churn rate is NOT divided by ( 1 + g ), but only the total customers at the end of the month, Ctotal end. This is the essence of Peter Cohen’s comment above and the explanation in the “note” under the main churn formula that Cend in the formula refers to ONLY those customers that are left from the original Cbegin. Or rather…. My reason for not including growth in the primary churn formula was just to keep it simple. PS For the mathematically inclined, it’s worth pointing out that this multiplicative build up of churn, then growth, implicitly assumes they are independent of one another. In truth, they are only independent when your measurement interval is ZERO. Much of the churn calculation issues arise from this and the tips above are very much about ensuring that growth and churn can be treated independently as a good approximation. I am subscribed to a SaaS organization. I purchased their item on a yearly membership premise. Restoration rate is 6 times lesser than the membership rate and any new item they offer is marked down at floor value rate for general clients. I like a Saas that works that way, It makes client upbeat and keep on remaining. Give no motivating force to existing clients and anticipate that every one of them will take off. Very informative, question would failed or declined billing attempts also count towards the churn rate or only when a customer/user cancels their subscription? Only subscriptions cancelled or terminated for non payment.